Indian Development Foundation in collaboration with the Office of the Joint Director of Tuberculosis, Govt. of Karnataka, National TB Institute, various other Associations and NGO’s at Bangalore observed World TB Day on 24th March in a fitting manner. Earlier His Excellency Sri T. N. Chathurvedi, Governor of Karnataka flagged off the rally from Raj Bhavan by 10.00 am in the presence of Hon'ble Sri R. Ashok, Minister for Health and Family Welfare and Hon'ble Sri Ramachandra Gowda, Minister for Science and Technology, Govt. of Karnataka. The rally was participated by a large number of students from various nursing schools and volunteers from the non-governmental organizations in the city. The participants of the rally were holding banners and placards on scientific information on Tuberculosis. The rally started from Raj Bhavan, passed through Ambedkar Road, K.R. Circle, Kasthurba Road and Hudson Circle and reached Puttanna Chetty Town hall, where a public meeting was organized by 11.30 am. Hon'ble Sri R. Ashok, Minister of Health and Family Welfare, Govt. of Karnataka and the chief guest for the function, said that the government of Karnataka has resolved to eliminate TB from the state. Bestowing awards on excellent medical practitioners, DOT providers and volunteers appreciating their good work in TB control and presenting prizes to six students who won in the school level essay contests, (conducted both in Kannada and in English and in which 50 schools from Bangalore Urban District participated), he appreciated the participation of the public and NGOs in the fight against TB and sought their continued cooperation. The Principal Secretary, Department of Health and Family Welfare, Smt. Usha Ganesh explained in detail the various governmental provisions and initiatives towards TB control. She regretted that the menace of TB still persisted as a large number of patients discontinued treatment in the halfway leading to the onset of multi-drug resistant TB. Dr. Maya Nadkarni, Joint Director (TB), Directorate of Health and Family Welfare, presided over the function. Dr. Shashidhar Buggi, Hon. Secretary, Karnataka State T.B. Association welcomed the gathering. Dr. Srikant Ghargi, Deputy Director (T.B), Directorate of Health and Family Welfare proposed a vote of thanks. Several dignitaries including, Dr. Soorya Narayana, from National Tuberculosis Institute, Dr. Subramanyam from Family Physicians’ Association, Dr. Rama Kumari, Project Coordinator (TB), Bangalore Mahanagara Palike, Dr. Beulah Prasad, St. Martha’s Hospital, Dr. Shanmugam, Indian Medical Association, Dr. Murthy from Private Hospitals and Nursing Homes Association, Mr. Nagaraj, President, Samrakshana Rehabilitation & Charitable Trust, Dr. K.N. Prasad, Dr. Bharati T. Kangrali, Dr. Rehana Begum, WHO consultants, Dr. Revadi, Physician, S.D.S. T.B. & RGICD, Dr. Anil Kumar Jha, Commissioner for KHSDP participated in the event and extended their valuable contribution. Cultural Programmes by St. Martha’s Hospital, Samrakshana Rehabilitation & Charitable Trust, SURAKSHA and AWAS were organized to entertain as well as enlighten the audience on Tuberculosis and its implications. The entire staff and officers of the Joint Director’s office had taken every effort to see that the programme was a successful one. Mr. C. Chidambaram, Manager – Southern Region, Dr. S. Franklin, Area Manager for Karnataka and the entire team of KN Indian Development Foundation enthusiastically participated in the programme. The initiatives of IDF in displaying TB awareness posters in schools and conducting essay contest for school students within a short time were well appreciated . On World TB Day I salute the 553 international organizations, donors from the public and private sectors, governmental and nongovernmental organizations, civil society members and individuals that now form the Stop TB Partnership as well as countries for your incredible contributions to the fight against TB. Tuberculosis remains a massive public health problem around the world, despite recent progress. Last year there were 8.8 million new TB cases and 1.6 million deaths from TB, many of them among people living with HIV/AIDS. And at present, XDR-TB, or extensively drug resistant tuberculosis, represents a threat to the entire world. Our best weapon is to implement the Global Plan to Stop TB, but the plan faces a funding gap of US$30 billion. Our arsenal of medicines to treat TB is more than three decades old. We need new drugs to fight this deadly scourge. And we need better diagnostic tests, especially in the face of XDR-TB, as well as new vaccines. In the millennium year, 2000, the Stop TB Partnership was formed to realize the goal of eliminating TB as a public health problem and, ultimately, to obtain a world free of TB. This year, for the first time it appears that despite the challenges the disease is leveling off. This gain is strictly due to your combined efforts. His Excellency Mr.Vishnu Hade, Indian High Commissioner for Botswana received Dr.ARK Pillai, President IDF yesterday at Gaborone and had informal talk on wide ranging social areas. The meeting took place in the Indian High Commission office at Gaborone. His Excellency was very appreciative of the yeomen services rendered by IDF for nearly twenty five years. India is poised for a great leap forward and economic development makes meaning only with all round social development, he observed. Dr.Pillai said that the position of TB-HIV AIDs in Botswana seems alarming if the press reports are to be believed and proper awareness programmes hold the key to improve the situation. Dr.Pillai said that IDF will be too happy to formulate a plan for Health Awareness Campaign for Botswana in the light of IDF experience spanning over two decades. HE Mr.Hade wished IDF all success in the coming years and hoped that some collaborative action can be planned to benefit the people of Botswana. Mrs.Indu Girish accompanied Dr.Pillai and gave her experience of teaching in Gaborone and the contribution being made by Mr.R.Girish in the field of Cricket for students in Botswana. St. Joseph's Matriculation School, Avadi, Chennai participated in the TB awarenes s campaign organised by Indian Development Foundation. The students of the school went around zealously spreading awareness to the parents and relatives on facts about TB. They emphasised the need for early detection and complete treatment. They raised the slogan - TB anywhere is TB everywhere. Mr. C. Chidambaram, Manager-SR of IDF appreciated the efforts of young budding students' self-service in conscientising the society. Congratulating the stupendous work by the schoolteam, Mr. Chidambaram presented a Special IDF memento to Rev. Sr. Headmistress of the school. Rev. Sr. Headmistress thanked IDF for giving the school an opportunity to participate in the national health programme and assured of all support in the future too. IDF team celebrated Gudi Padwa festival with the children of Shyama Vidya Mandir, an Empowerment Class Programme of IDF at Tammnathwadi, Karjat, Dist. Raigad, Maharashtra. Gudi Padwa is the New Year of Maharashtrians which falls on 19th March. IDF team comprising Mr. N. D. Shete, Dr. Narayan B. Iyer, Dr. Sharad Nayampally and Mr. Sanjay Waghmare visited the project area this morning. Mr. R. D. Gadkari, Vice-President of IDF also joined the visiting team. The children of this tribal belt were eagerly waiting to meet the IDF team and receive gifts during the festive occasion. IDF team explained the importance of Gudi Padwa festival and distributed gifts and sweets to the children and the villagers. A good number of dress materials mobilized from the IDF networking sources were also distributed to the villagers. Ms. Supriya Deshmukh, teacher of Shyama Vidya Mandir explained the overall working of the Empowerment Class. Children also came forward and greeted the team. The team congratulated Mrs. Vimal Sambhaji Katkari who recently won the Panchayat Samiti elections. Shyama Vidya Mandir falls under the jurisdiction of Mrs. Vimaltai who was an ardent supporter of educational programmes run by IDF. She assured of all help to IDF run programmes in the tribal area. Education and water for the Panchayat are the prime areas in her agenda. The team also visited a couple of houses in the village and distributed gifts and sweets as they wished Gudi Padwa Greetings. IDF wishes you all a Happy Gudi Padwa. No one should abandon duties, because he sees defects in them. Every action, every activity, is surrounded by defects, as fire is surrounded by smoke. IDF through its various networking sources has mobilised clothes for the use of poor leprosy/ TB patients and needy persons in the Project areas. For several years, IDF has been mobilising used/ discarded clothes from Hotels/ Industries & friends. The materials received are segregated according to the need of the projects. They are sent to laundry & arranged well for distribution. Today we have sent one consignment containing warm clothes to our Project, NILES (Nilgiris Leprosy Eradication Scheme) in Coonoor, The Nilgiris in TamilNadu. The consignment has been sent through TCI and the same will be delivered shortly in the Project area. Mr. Jesudas, the Project Incharge will receive and distribute the clothes to the people in the hilly region. The second lot will be distributed to the tribal people near Karjat in Raigad District of Maharashtra on 17th March 2007. IDF team will personally visit this belt and distribute the clothes to the poor people in the region. 19th March being the Gudi Padwa Festival, the New Year of Maharashtrians, IDF will convey New Year wishes to the people in Karjat and distribute sweets to the tribal community. Join hands with IDF. What is possible today, may not be possible later. Don't postpone goodness in life ? Happiness is a Funny mathematics. It Multiplies, when you Divide. The Men in Blue are out there carrying with them the nation's aspirations. Catchy moment are back again where for the next few days all battles will be fought on the cricket pitch. Let's wish the Men in Blue GOOD LUCK for their performance. The first Match will kick start from 13th March and after completion of the 51st Match the WINNER will be announced on 28th April. Let's gear up to see the most scintillating matches and enjoy the spirit of cricket. Of course, the better team has to WIN. Dr. A. R. K. Pillai, President, Indian Development Foundation called on Ms. Maungo Mooki, Chairperson, Botswana Council of NGOs at Gaborone on Friday the 9th March. Dr. Pillai apprised the work of IDF and explained the activities of the Foundation in humanitarian benefit. Ms. Maungo Mooki appreciated the work carried out by IDF and congratulated Dr. Pillai for leading a wonderful team serving the humanity. Ms. Maungo Mooki conveyed her best wishes to all the workers of IDF involved in social work. Incidentally Dr. Pillai is currently touring Botswana (Africa). Mr. R. Girish and Mrs. Indu Girish accompannied Dr. Pillai during his visit to the NGOs Council. Women of today are empowered, establishing their identity and creating a revolution in the Society. Women today have excelled in every field of activity and many have carved a niche for themselves for which they deserve to be lauded. Kudos to the women of today ! Though there are great progresses made by women, but they still remain the most exploited and weaker section of the society. Gender imbalance, education, social security, employment and a lot need to be attended to improve HER overall development. DNA, a leading newspaper in Mumbai has covered the support given by New Horizon Public School to IDF programmes. For complete view of the report `IDF felicitates New Horizon' - click on the link given below. IDF salutes DNA for the continued support. Prayer does not change things. It changes people and they change things. Airoli based New Horizon Public School did excellent work supporting humanitarian causes under the banner of Indian Development Foundation. The students of New Horizon School took part in the leprosy and TB awareness campaigns in a massive scale. In addition to health awareness programmes, the young tiny tots also mobilised voluntary resources from the society for the benefit of poor leprosy patients. Dr. Narayan B. Iyer, National Co-ordinator of Indian Development Foundation congratulated the New Horizon Schoolteam for the wonderful participation in nation-building activity. Students participation in social work needs to be written in the letters of gold, Dr. Iyer said. Students have always been in the forefront of social movements and New Horizon School students have set a shining example for others to emulate, Dr. Iyer expressed. Dr. Narayan B. Iyer was speaking at the Prize Distribution function organised during the morning assembly on Friday the 2nd March 07. Dr. Iyer presented IDF Certificate of Excellence to the Principal Mrs. Bulbul Sengupta. The Vice Principals of the School Mrs. Jyoti Nair (Secondary Section) and Mrs. Wilma D'souza (Primary Section) also joined in receiving the Certificate. 33 students were also awarded with IDF Certificates and special prizes for their excellent performance in social work and resource mobilisation. Mr. Nicholas Correa, Regional Head of New Horizon Public School expressed his happiness as his students took part in the social programmes benefiting several poor leprosy patients. But for the drop, the ocean cannot be formed, Mr. Correa expressed with a smile. Indian Development Foundation organised Holi celebrations with the trainees of The M.N.B. Industrial Home for the Blind in the Home premises at Jogeshwari on Saturday the 3rd March 07. The M.N.BanajeeInd ustrial Home for the Blind is a Training Centre for Adult Blind and Hostel for working Blind located at Jogeshwari (West) in North Mumbai. Dr. Narayan B. Iyer, National Co-ordinator of IDF wished Holi greetings to the trainees in the Home and expressed happiness in celebrating the auspicious festival with the visually challenged persons. When the world around is celebrating the festival with colours and sweets, it gives me immense pleasure in spreading the colour of love among the visually challenged persons, expressed Dr. Iyer. Dr. Iyer remembered the quote of Helen Keller that the best and most beautiful things in the world cannot be seen or even touched, but they must be felt within the heart. The trainees felt very happy as they received T.Shirts donated from Mr. Jindal of SPL Limited, Faridabad. IDF team also presented sweets on the auspicious occasion. Symbolic colours were presented to mark the event of Holi. One could see glowing happiness on their faces as they celebrated the festival of colours by spreading the colour of love. Indian Development Foundation in collaboration with Podar International School of Santacruz celebrated Holi Festival with the children of St. Catherine's Home at Andheri this evening. CAS Co-ordinators Dr. Anuradha Sridhar and Ms. Sarala Gavane from Podar International School said Holi festival gives us an opportunity to wish and greet each other. 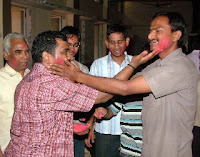 There is no age bar in playing Holi and sharing happiness. It is an opportune time for us to come together and spread the joy of happiness with the underprivileged children in the society. The CAS Co-ordinators led a team of 30 students from the Scho ol along with a group of teachers who visited St. Catherine's Home and played holi with the children in t he Home. Dr. Narayan B. Iyer, National Co-ordinator of IDF explained to the visiting students about the activities of the Home and inculcated social values during festive occasion. Spreading the colours of love and happiness should be our motto, said Dr. Iyer. Let us leave an indelible impression of happiness in the minds of the c hildren, exhorted Dr. Iyer. Podar students explained the importance of Holi to the Home children and gave them a brief of making natural colours out of flowers, leaves and vegetables. One should avoid using colours made of chemicals which will harm the skin. Natural colours are the best alternative for playing holi, said Dhruv and Nimisha from Podar School. Mr. Karthick Sridhar, Social Entrepreneur of IDF joined the group in celebrating Holi and distributed natural colours made of flowers, leaves and vegetables to the children of Home. Mr. Venkat Ramanan Iyer and Mr. Jayaraja Acharya from IDF took part in organising the event. A group of children from the Home presented a song on the occasion of Holi while Rev. Sr. Lorreto, Headmistress of St. Catherine's High School conveyed her good wishes and blessed the students. Podar students distributed ice-cream, sweets and eats to the children of St. Catherine's Home and wished them a Happy Holi. Mr. Anish Hafizi from Pestonji Ice-cream generously sponsored ice-cream for the children of the Home.